Centrepiece at book launch for "Mourning Emporium" and Cover bird for the Women's Ink anthology "Flight of Fancy". Re Blair-eyed Cormorant: I made the cormorant to be a focal point for the publishing party to launch Michelle Lovric's “The Mourning Emporium”. I like to use recycled materials in my papier mâché sculpture, and kind friends supply me with many varieties of wire and paper. 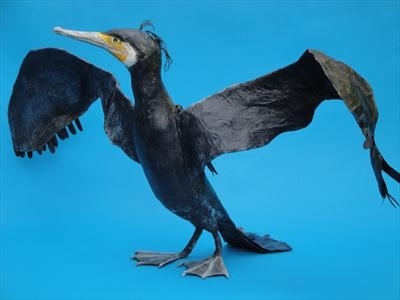 The cormorant “George Blair” has a wire armature and a mixed body of pulped paper with layers of various papers and some fabric. 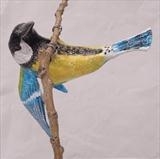 He’s painted in acrylic. Tony Blair has kindly (though unwittingly) donated his eyes. I will leave it to the viewer to decide whether this contributes to George’s malevolent air!